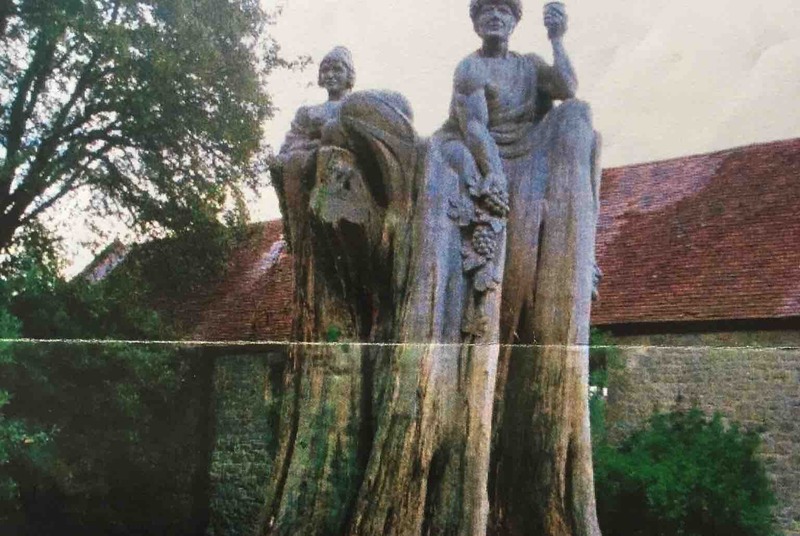 A campaign has been launched to fund the return of a large-scale wood carving that left the Island when music and film producer, Robert Stigwood, moved to Ascot. It’s hoped the sculpture can be returned to East Cowes for all to enjoy. Isle of Wight councillor for East Cowes, Karl Love and his partner, David Hill have launched a campaign to see the return to East Cowes of the ‘Stigwood art’ that once graced the gardens of Barton Manor. Following the great storm of 1987, the then-owner of Barton Manor, music and film producer Robert Stigwood, commissioned a wood carver to create a piece of art from the remains of a Monterey cypress tree. 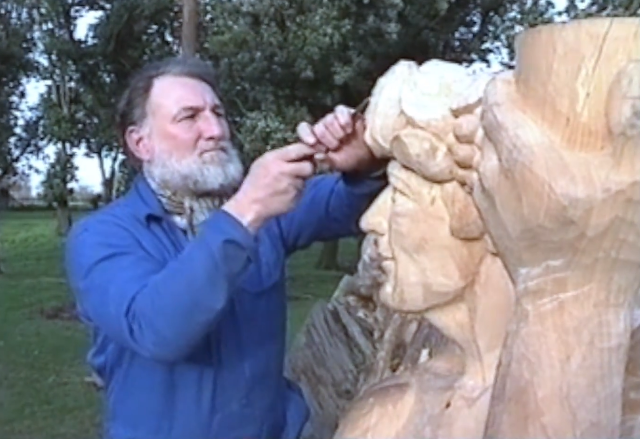 Isle of Wight wood carver, Norman Gaches, was given free rein to design the carving. He selected Dionysus, the greek god of wine, which Norman said was particularly appropriate because of Barton Manor’s vineyards. Alongside Dionysus stands Ariadne, a figure of Zeus (portrayed as Robert Stigwood) and a goat. This project was the first time that Norman had carved a tree that was still rooted into the ground and he went on to create many other carvings on the estate. A exhibition earlier this year at Quay Arts showed paintings, sketches and tools used by Norman to give an insight into the conception and development of his wooden wonders. When Robert Stigwood left the Island, the carving went with him, but has remained at an Ascot garden centre ever since. He told OnTheWight that the custodians of the artwork are willing to allow it to come back to the Island, but money is needed for the transportation, new mountings and restoration work. “David and I traveled off the Island and obtained permission to recover the wood sculptures created by Norman Gaches, which we seek to return home to our Island to be located somewhere in our town as an Art exhibit for all to enjoy and see. “Grease, Saturday Night Fever and Jesus Christ Superstar are all productions many of us are familiar with produced by Music Producer Robert Stigwood former resident of Barton Manor Near East Cowes. If you would like to help see the return of the Stigwood sculptures, you can make a donation via Go Fund Me. 5 Comments on "Fundraiser for return of Norman Gaches ‘Stigwood art’ to the Isle of Wight launched"
I think this would be great to see back on the island. Norman Gaches was world reknown and we need to remember our island residents. How much is needed to transport the carving back to the island? Have you contacted his family?